This document is a case study, analyzing and discussing the topic question: Is it Safe to Go to Hospital? Or is MRSA a Problem? BIOLOGY CASE STUDY; FOR GCSE TRIPLE SCIENCE Is It Safe To Go To Hospital? Or Is MRSA a Problem? 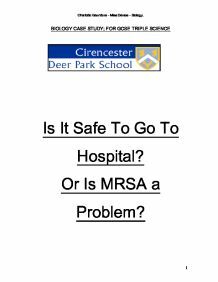 Charlotte Saunders CIRENCESTER DEER PARK SCHOOL This document is a case study, analyzing and discussing the topic question: "Is it Safe to Go to Hospital? Or is MRSA a Problem? This case study has been written using articles, personal knowledge and opinions, newspapers, and textbooks all sources have been listed in the bibliography (see contents page for directions). The aim of this case study is to selectively conclude on the question that the title poses, and to be able to explain why. _________________________________________________________________ Contents Page, [STRUCTURE OF THE CASE STUDY] _________________________________________________________________ Introduction - What Is The Issue? Why Do Some People Think This Is A Problem? Who Will MRSA Affect? Some Science behind MRSA What's The Problem with MRSA? Background - What Is MRSA? How Can It Affect People? MRSA Infections in hospitals. MRSA Infections in the Community How is colonisation with MRSA diagnosed? How Has Antibiotic Resistance Helped the Spread of MRSA In hospitals? What Can Stop The Spread Of MRSA? NHS GUIDELINES Why Hospitals Should Be Liable For the Spread of MRSA - Evidence to show a correlation between hospitals, and MRSA Why the spread of MRSA, can only be linked to Hospitals. The Legislations regarding hygiene in Hospitals - What Legislation and Hygiene rules are in place? How they are failing? And How Are They Succeeding? What new rules I would impose, if in charge of the Nations Hospitals. Conclusion - Assessment of the Articles, Supporting the fact that MRSA is a problem, and articles stating that MRSA is not a problem within hospitals; In my conclusion I will also aim to deliberate upon the scientific facts, and off my interpretation of these facts. Bibliography - List of Sources that I have used, with references to websites; with a reliability scale; I will also talk about how relevant the articles were, and from what context I took the extracts that I have included in my Case Study. ...read more. the insertion of devices to provide essential treatment; Those staff providing such care will also be at risk, of picking up, in particular, bacteria, which may never affect them as healthy individuals, but may be a factor in cross infection to vulnerable patients. Other staff and visitors may be at risk also. How Has Antibiotic Resistance Helped The Spread of MRSA In Hospitals? As many articles have already displayed, the cause of MRSA, is linked to our Hospitals. But should our, over stretched resources and inadequately trained hospital staff be blamed, or should the management behind the NHS take the bullet. It is fair to say, that the real victims of this are patients, and their families, that have been affected, by death or injury, as a result of the spread of MRSA, but legislation has been put in place to stop the spread of this terrible disease, if any? And why wasn't the nation's healthcare fully prepared for a super bug of this scale? MRSA is an infection, and like many other infections can be treated by a completed course of antibiotics but in this case lately it has been fuelled by antibiotic resistance. The diagram to the left displays the affects of antibiotic resistance compared to normal affects of antibiotics. Antibiotic resistance is a specific type of drug resistance when a micro-organism has the ability to withstand the effects of antibiotics. The diagram shows how the bacteria continue to multiply, resulting in higher death and infection rates. Antibiotic resistance evolves via natural selection acting upon random mutation, but it also can be engineered by applying an evolutionary stress on a population. Once such a gene is generated, bacteria can also then transfer the genetic information between individuals. If a bacterium carries several resistance genes, it is also called multi-resistant or, informally, a super bug. What Can Stop The Spread Of MRSA? NHS GUIDELINES After reading many protocol leaflets obtained from the NHS website and my local doctors surgery there are a few main steps that professionals seem keen to enforce to help control the spread of the super-bug MRSA. ...read more. Conclusion - Assessment of the Articles, Supporting the fact that MRSA is a problem, and articles stating that MRSA is not a problem within hospitals; In my conclusion I will also aim to deliberate upon the scientific facts, and off my interpretation of these facts. I have used selected parts of articles to support my defined sections in my case study. This is in order to give a full understanding regarding the set-up of Hospitals and a background of how the spread of MRSA is linked to them. My case study title is 'Is It Safe to Go to Hospital? Or Is MRSA a Problem? My research into MRSA has clearly shown that it is a potent threat to all of us, not only in hospitals, but also in the community. I feel I have answered my original question extremely well, as i have explored all the possible extras regarding MRSA & Hospitals, and have highlighted the link between the two. Ultimately I feel that MRSA is a growing threat, incubated by failing hospital standards and the fate of evolution. As I discovered the MRSA bacteria has evolved into strains both suited to hospital and community environments this shows that it has been growing and strengthening for a long time, long enough for us to stop it, but no. Hygiene and hand washing is the only vital factor that we can control that relates to the control of MRSA, for it has already developed antibiotic resistance. The scientific facts show that MRSA is a more complex version of other regular bacterial infections, but with nastier consequences. Most of the articles that I have used have been written from a perspective that is accustomed to the affects of MRSA, i.e. a medical professional, or a journalist immersed in the details of MRSA. This means that sometimes the reality of MRSA is lost in translation, which can lead busy hospital staff to not carry out duties, and patients to not be worried by this. ...read more. These can have bad side effects e.g. mood swings and worn out muscles. * As a drug alters the way your body works, you can become tolerant to them. This means you need to increase the dosage of the drug to get the initial desired effect. Eventually, your body may not function normally without the drugs. Forensics and behaviour - innate and learned behaviour. convey information such as the location of food, or a signal to protect the hive and queen. How do animals feed? When the lion and cheetah catch a zebra they have to kill it as soon as possible.